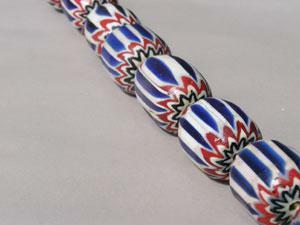 Strand of approximately 1 inch long, 6 layer red, white and blue antique Chevron Trade Beads made of glass canes by the Murano, Venetian or Bohemian Glass Industry in the 16th century. Rendezvous out at Jarman’s Prairie!” So we all drove out there, winding thru the hills and areas of Skagit County that I really didn’t even know existed. This beautiful private place of great history of pioneer Blanket Bill Jarman is very appropriate for a Mountain-man Rendezvous. A comfortable amount of people attending in full backwoods regalia were pacing off the black powder shooting course and setting up their camps and shops. We had a lot of fun wandering around. Owen, of course, was very interested in the gun aspect of it all since he collects black powder rifles, and I zoomed in on the beads. There was a woman there who collected and sold trade beads for costuming. Ah hah! 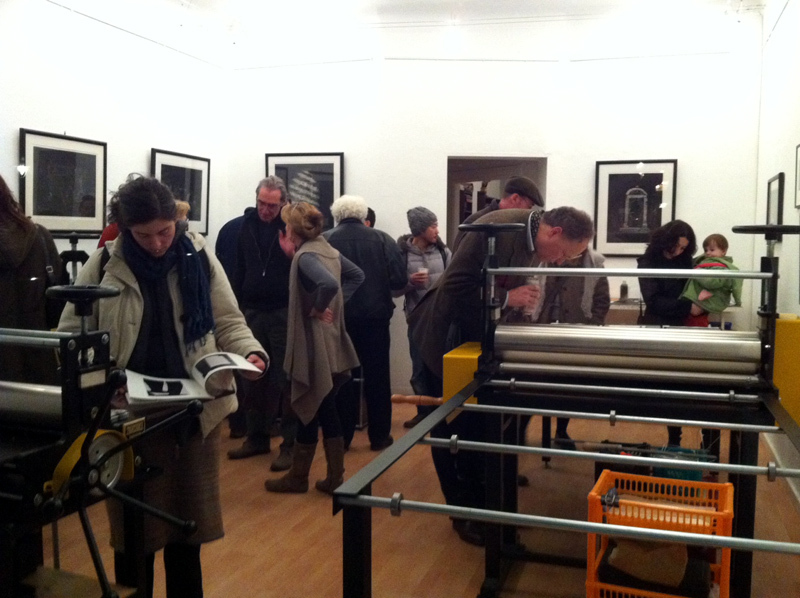 The light went on! There’s more to these guy-gun shows than guns and looking at the handsome men! One of my best trade bead “scores” was made at the Cascade Mountainmen’s Annual Muzzle Loading Arms and Pioneer Craft Show in Monroe, WA. I spotted a couple of young men with a table of odds and ends for sale; walking sticks, badges, old steel knives, old postcards, old spurs and harnesses, some old costume jewelry and one strand of big dirty old striped beads. I knew immediately what they were despite the dirt! And they were so cheap!! I bought them and crowed all the way home…CHEVRONS. It was quite a job to clean them up too. I’ve since found chevrons in other colors, but none at such a great “score”. Collection of blue and green chevron trade beads made of clusters of glass canes by the Murano, Venetian or Bohemian glass industry in the 16th century. The Chevron, also called the Rosetta bead is made by the arrangement of three or more colors in usually six layers. Stringers or colored canes are spaced between each other in the round so that viewing from the end of the bead forms a star or flower-like shape. These beads I found were rich dark blue, opaque brick red and opaque white. Chevron beads were made at Murano, Italy from the early part of the 16th century. These that I bought are very old! The famous 1971 Arizona Highways Magazine Bead edition tell us that the Chevron was used in North Africa as a weight on the ends of camel saddle blankets and it’s possible that these beads found their way into the Southwest American continent by way of Beale’s Camel Corps from 1857 to 1861. I’ve seen pictures of their use on horse tack and costumes. Grandmother Eagle cast Sterling Pendant with Abalone inlay strung with Chevrons, blue Russians, and Hudson’s Bay White Heart trade beads with hand-carved Sterling feathers. The gorgeous huge old Chevrons just ached to be made into something special and powerful so I made a Legend Necklace called Grandmother Eagle with them. I carved the wax for the Eagle Pendant and Owen cast it in Sterling and inlaid Abalone shell. I designed the Sterling feathers and Owen cut them out and engraved the “feathering” on them. And Earrings with Sterling Silver and Chevron Trade Beads too. 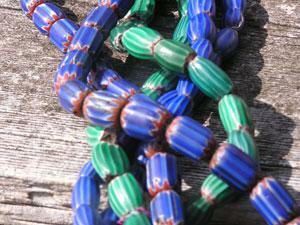 Read more about Trade Beads at Walker Goldsmiths. Hey Janet I saw that video about trade-beads on your website. Great job! Some things I like about your jewelry is the historical element and the story. 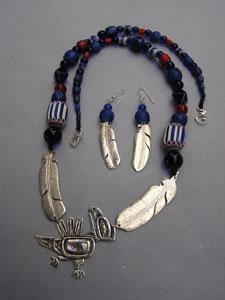 There is a lot to see in the necklace, with a history in each bead, and Eagle has many stories.